This script allows you to replace the default gameover scene with an event. This gives you more control over how the gameover scene should process. A gameover event is a common event and is assigned to different objects. There are several different scopes of gameover events. 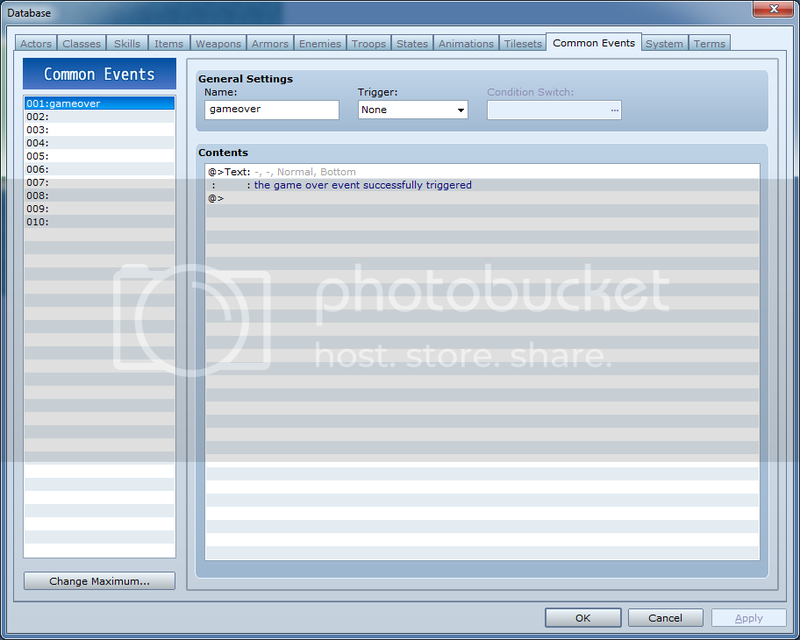 Troop gameover events. These occur when you gameover during battle. 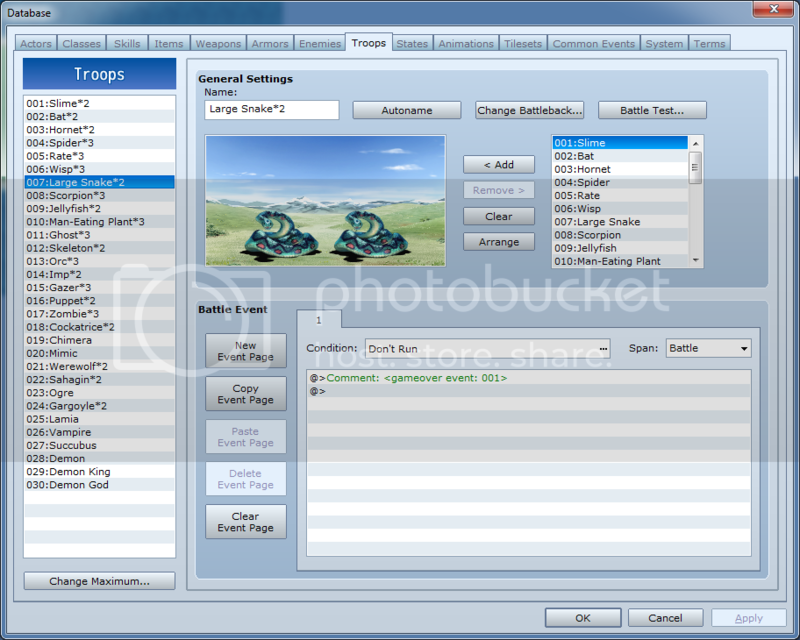 Each troop can have its own gameover event. Map gameover events. These occur when you gameover on the map. Each map can have its own gameover event. Hi, I downloaded your script and tested it.. It worked, but I want to ask a question. Let&apos;s say I want to make the character teleports back to village instead of returning to title screen, how to do that? I&apos;m still very new with custom script so I&apos;m confused.. This script was not intended to allow you to go back to the map. It simply replaces the way the game over screen is handled and then returns to the title map afterwards. You&apos;ll need another script that will provide that functionality. Okay. It somewhat works. In that it now works during battle. But it now doesn’t work if I trigger a gameover from an event on a map and in fact causes the entire game to crash because it’s trying to read line 57 of game_troop when I trigger a gameover. So for record. If I add a game over line to an event it now causes the world to explode so long as this script is in place. I didn&apos;t check that there was no troop. Should be working now. This script doesn&apos;t work properly for me. It works for map based game over events, but troop based ones do not in fact work. And I&apos;ve verified this by making a vanilla project where this script is the only custom content. It works for me. Did you save your game? No saves are involved in my testing procedure. I have a 5×5 square of grass set to have snake encounters and that&apos;s it. I start the game, walk around, encounter the bad guys, die, fail to get the message. Only way i get the message is if I add it to the notes for the map (Which is not useful for my purposes). Adding it as a comment on the event for the troop, doesn&apos;t work. And no for the hell of it I tried saving the game, quitting to title, then loading the save and having the encounter and that didn&apos;t help either. Upload your project on dropbox or mediafire. I am not having an issue with the comment in a troop, losing to it in battle, and having the custom game over sequence. When I said “save” I meant saving your project. Some people like to testplay their troops directly via the troop editor and then wonder why none of the scripts work. I&apos;ve been using the playtest button. I figured it might have issues with me doing it from the troop tester. here is link: be baffled, or point out the obvious error, one of the two. My experience with RPGMaker is limited. Thanks for noticing a bug. I&apos;ve updated the script to address the issue. Replace your copy with the latest version and it should work. I can’t get this to work would anyone mind sending a demo of this? Can this script transfer the player from a battle to a specific map to run a gameover event from there (bypassing normal gameover)? Looking forward to that! Good luck!